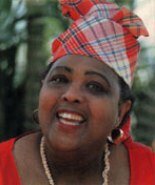 Louise Bennett - Coverley, OM, OJ, MBE (September 7 1919, Kingston, Jamaica –July 26 2006) is a celebrated and much-loved Jamaican folklorist, writer, and artiste. Looking to purchase/download Louise Bennett best songs and poems? Sure! Amazon now has them at great prices. Click here and visit Amazon to see them! "Miss Lou", as she was affectionately known, received her education from Ebenezer and Calabar Elementary Schools, St. Simon’s College, Excelsior College and Friends College (Highgate). She was a resident artiste from 1945 to 1946 with the “Caribbean Carnival”. She appeared in leading humorous roles in several Jamaican Pantomimes and television shows. She traveled throughout the World promoting the culture of Jamaica by lecturing and performing. Although her popularity was International, she enjoyed a celebrity status in her native Jamaica, Canada and the United Kingdom. Her Poetry has been published several times, most notably Jamaica Labrish-1966, Anancy and Miss Lou- 1979. 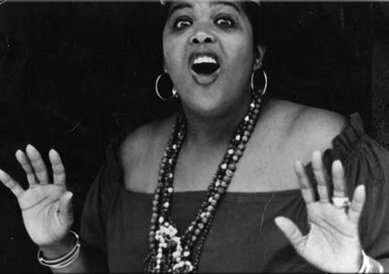 Among her many recordings are: Jamaica Folksongs-Folkways 1953, Jamaica Singing Games- 1953, Miss Lou’s Views-1967, Listen to Louise-1968, Carifesta Ring Ding-1976 The Honorable Miss Lou-1981, Miss Lou Live-London-1983 and Yes Me Dear-Island Records. She was married to Eric Winston Coverley since May 30, 1954 and has 1 son and several adopted children. In 1974, she was appointed to the Order of Jamaica. On Jamaica’s Independence Day 2001, the Honorable Mrs. Louise Bennett-Coverly was appointed as a Member of the Jamaican Order of Merit for her invaluable and distinguished contribution to the development of the Arts and Culture. She wrote her poems in the language of the people known as Jamaican Patois or Creole, and helped to put this language on the map and to have it recognized as a language in its own right, thus influencing many poets to do similar things. In 1986, she appeared as Portia in the 1986 comedy Club Paradise, starring Robin Williams, Jimmy Cliff and Peter O'Toole. She died in Toronto, Ontario, Canada on July 26, 2006. A true Jamaican icon, may her soul rest in peace. Incidentally, the poems of "Ms Lou" are also my favourite Jamaican poems! Follow that link to see (and print) them. Do check the list of famous Jamaicans to see who else have made their mark on this, our little rock we call Jamaica.